Tomas Hägg is known primarily for his work on the ancient Greek novel, but he was a scholar with unusually wide research interests, ranging from late antique Nubia to medieval Persia and including various genres of ancient and Byzantine literature. He was also an unusually generous scholar, oﬀering help and advice to numerous students and colleagues, some of whom are now part of NBN. The network has therefore decided to express its regret and respect by inviting three young scholars from diﬀerent disciplines to describe their scholarly relation to and memories of Tomas Hägg. For a more traditional obituary, see the statement from the University of Bergen (in Norwegian). For a complete list of the publications of Tomas Hägg (1969-2004), see Parthenope: selected studies in ancient Greek ﬁction (1969-2004), ed. Lars Boje Mortensen and Tormod Eide, Copenhagen 2004. I was well on my way to dropping out of the PhD programme when I got to know Tomas. Of course, I had met him before, twice I think. Read some of his work too (well, cursorily at any rate), but I had, perhaps characteristically, been too hurried and too self-absorbed really to take notice. Come to think of it, Tomas did once accuse me of solipsism; we didn’t meet or even write all that often, but we almost always managed to argue about something when we did. Our ﬁrst meeting proper, one of our longest ever in fact, took place at Stockholm Central Station. There I was, a doctoral student on the brink of utter failure, in desperate need of new supervision. To the scholarly tradition, with which I was at such odds, Tomas had seemed like the best rescue plan. After all, he himself had come from the very same tradition. But it wasn’t only that he knew it well, tradition knew him too, as someone who had long, in a sense, dropped out of it (but in a successful way), and who would eventually come to supersede it. In Uppsala, there was at times something special about the way in which his name was spoken out loud, impossible of course to reproduce in writing. I am very fortunate that he agreed to guide, to spur and to challenge my studies to completion. At the time, I had just broken up, as it were, with the Greeks. Unlike me, Tomas had never loved antiquity, as he would later tell me. Nor did he ever seem to adore his own mastery of the languages and the literature of the Greeks and Romans. This set him apart from many a Classical philologist. To be sure, he was highly passionate about research, that of others no less than his own. I was often amazed at his ability early to realise where I was going with an interpretation, and his generosity and skill in helping me to get there, to get it across in my own terms, even though he may not always have agreed with either the content or the tone of the arguments. I especially recall our diﬀerences on the matter of whether or not it is beﬁtting of a (Swedish) academic to mention tax money – or indeed various wars. As passionate as Tomas was about research, and as much as he’d encourage and help others to work (in a place like Fondation Hardt, for instance, which he repeatedly tried to sell), with me, he always kept what I would call a healthy distance from both magisterial personae and scholarly heavens. I always felt that he fully respected those of us whose ﬁrst priority was another than “the calling”. This too set Tomas apart. “I am not a revolutionary”, he wrote to me a couple of years ago. While that may well have been the case, Tomas did nothing less than revolutionise my doctoral studies. Nutters aside, he remained my ﬁercest critic, but even so, like few others, he would boost my conﬁdence and sense of worth as a Classical philologist. In the Swedish tradition, I count Tomas as one of the few proponents of philology old and new. With his critical acumen, and his intellectual and respectful curiosity, he set standards both as a supervisor and as a colleague, standards to which we all should aspire, however short we may fall. In the spring of 1995 I was sitting on a train, on my way to Bergen to meet Tomas Hägg. I was terriﬁed. Here I was, an ignorant girl who had just barely began my doctorate studies, and I was on my way to meet one of the most important scholars working on ancient novels. I mean really, what was I supposed to wear? My fears were unwarranted, I realised that as soon as I entered his oﬃce. The famous professor Hägg looked a bit like Santa Claus with his white beard and kind eyes, he was wearing slippers and a wool cardigan, and one of his twin daughters was playing in a corner since she had a cold and couldn’t be at the daycare centre. He had carefully read my dissertation plan and commented upon it with circumspection and respect. Then we had a sandwich and a cup of tea, he gave me a bunch of articles to read, advised me always to be very scrupulous about my bibliography, and oﬀ I went back to Göteborg – happy and still slightly puzzled at the tranquil modesty of this great scholar. Tomas was never my formal supervisor, but starting with this ﬁrst meeting in 1995 he was a meticulous reader of the successive drafts of my doctoral thesis. We didn’t meet very often, but when we did he was always attentive and focused on my work, even if he was in the middle of a conference and surrounded by peers seeking his attention. We have discussed narrative technique during cocktail receptions at Dumbarton Oaks, talked about topoi of the ancient novels over dinner in Groningen, and argued for and against the use of tables and diagrams in literary analysis while having a beer in London. It was always inspiring to meet Tomas, because he truly listened to what you had to say and took any idea or contradiction seriously. To have someone like that within reach while struggling with your dissertation is a great privilege. It was Tomas’ expertise in the ancient novels that brought about my trip to Bergen. In spite of the world-wide fame of The Novel in Antiquity (1983), which had ﬁrst appeared in Swedish in 1980 (Den antika romanen), Sweden had not seen any growing interest in the ancient Greek novel – in fact, no interest at all. So for someone wishing to work on the even less known Byzantine novels, suitable advisors were not easy to ﬁnd. I didn’t know back then that Tomas had also worked with Byzantine authors, nor did I realise how wide his research interests were. He certainly was a rare classicist, perhaps not so much in his interests as in his respect for various kinds of cultures and their respective textual production. He showed the same respect to texts as he did to people, which opened up for endless forms of collaboration and which also made the transition from being a doctorate student to a colleague very easy – there was no diﬀerence in the relation, because there had always been mutual esteem. In an academic world that often seems ﬁlled with intriguing, namedropping and tinkering with the rules, Tomas was ever decent and fair. He showed us that it’s possible to keep one’s integrity while being generous with one’s attention. I think many of us wish we were more like him and we cannot really understand that he’s no longer around to give us advice. But the example he set to us will continue to have an eﬀect on our respective environments and even if he cannot help us to sort things out we can still turn to our experiences and memories of how he would have handled a given situation. I want to remember the words of encouragement he would oﬀer whenever I had problems during my time as a doctorate student, because I need them (far too often) in order to encourage young colleagues. A second memory of great importance is the many laughs we shared, in both good times and bad. But above all, I often recall that ﬁrst meeting in Bergen, because it completely threw over my prejudices of how a ‘great professor’ should look like and behave. Thank you, Tomas, for teaching me that it’s always best simply to be yourself. Everyone’s life is marked by speciﬁc events, during which some people play a signiﬁcant role and therefore assume a special position in one’s self-awareness and subsequent development. In an academic career, for example, the ﬁrst study, the contribution to an important conference, and the ﬁnding of a haven for one’s personal and professional activities are landmarks to one’s progress. In my current involvement with Nubian Studies, all these three events were linked in some way or another with the same person: Tomas Hägg. Nubian Studies have attracted my interest since undergraduate years at the University of Ioannina, Greece. The reason was a combination of the teachings of professor Vassileios Christides on the relations between Byzantium and the Arab world, and the sharing with him of my experiences of Northeast Africa. These were based on the one hand on my origins from my mother’s side from Egypt, and on the other on my personal contacts, since 1994, with members of the Greek Community in Khartoum, the capital of Sudan, and the main country in whose territory Nubia is situated today (the Egyptian part is under the waters of the artiﬁcial lake formed behind the Aswan High Dam and the Nubian people resettled further downstream in the Egyptian Nile Valley). During annual visits to my friends in Sudan, I had started investigating the links between the cultures of the Mediterranean Sea and the Middle Nile Valley, with the support of my ﬁrst contact in the National Corporation for Antiquities and Museums in Khartoum, the late Director of Fieldwork Salah Omer al Sadig. One day he asked me to prepare for publication two fragments of two terracotta funerary stelae that had come to his oﬃce after a chance ﬁnding in the course of public works in the Northern Province (ash-Shimaliya), to which Nubia belongs today administratively. Both those stelae preserved parts of funerary formulae in Greek, following the Euchologion Mega type of prayer for the dead. The ﬁrst attestation of this prayer can be found in a 7th-century papyrus discovered at Nessana, Palestine. To this day, it serves the funerary rituals of the Greek Orthodox Church. It has been used on gravestones, though, exclusively in Christian Nubia. In fact, in the period between the 8th and 12th centuries CE, the bulk of the funerary stelae in Greek (for there are also many in Coptic and some even in Arabic) from the three kingdoms of Medieval Nubia, namely Nobadia, Makuria, and Alwa, were inscribed with this type of prayer. From the ﬁrst ﬁnds of such stelae, the text has been seen as a sign of the strong links between Christian Nubia and Byzantine Christianity. The most illuminating paper on any such stele ever, and the one that helped me to identify the two fragments I was working upon, was written precisely by Tomas Hägg. I got to know about his work after the advice of professor Christides, with whom Hägg was in cooperation through the Institute of Greco-Oriental and African Studies (IGOAS), of which he was a member and which is still directed by Christides. It was at a conference organized by IGOAS in 2002 that I ﬁrst presented these two terracotta funerary stelae referring extensively to the work by Hägg, as well as to the work of the Polish epigraphist and professor at the University of Warsaw Adam Łajtar. In that ﬁrst contact with Hägg, he had advised me to contact his Polish colleague, stating: “I would advise you to … look especially for articles by Adam Łajtar, who is now the best expert on these matters … since I have myself left that ﬁeld of study”. Regardless how true his statement has proved, it also showed the sincerity and modesty of Tomas Hägg. Four years later, in the 11th International Conference of Nubian Studies, held in Warsaw in 2006, I found myself in the honorable position of presenting in a panel with contributions by both Hägg and Łajtar a study on another almost exclusively Nubian phenomenon of monumental epigraphics: the custom of using terracotta plaques to inscribe funerary texts and set them as stelae on the graves of some of the Christian population in Medieval Nubia. And while Łajtar was indeed presenting new fascinating inscriptions discovered in the latest excavated sites of Northern Sudan, Tomas Hägg attempted the third general discussion of the use of Greek in Nubia in a Nubian Studies Conference: ﬁrst came “Some remarks on the use of Greek in Nubia” with a focus in Lower Nubia, i.e. mainly Nobadia (1982); then “An Assessment of the New Material” based on ﬁnds from Upper Nubia, i.e. mainly Makuria (1998); and ﬁnally a set of observations upon the work of the new generation under the title of “Nubian Greek Revisited” (2010). Although impressed by the progress in the ﬁeld, Tomas Hägg was the most appropriate scholar, and perhaps the only one qualiﬁed enough, to summarize the signiﬁcance of the recent achievements. 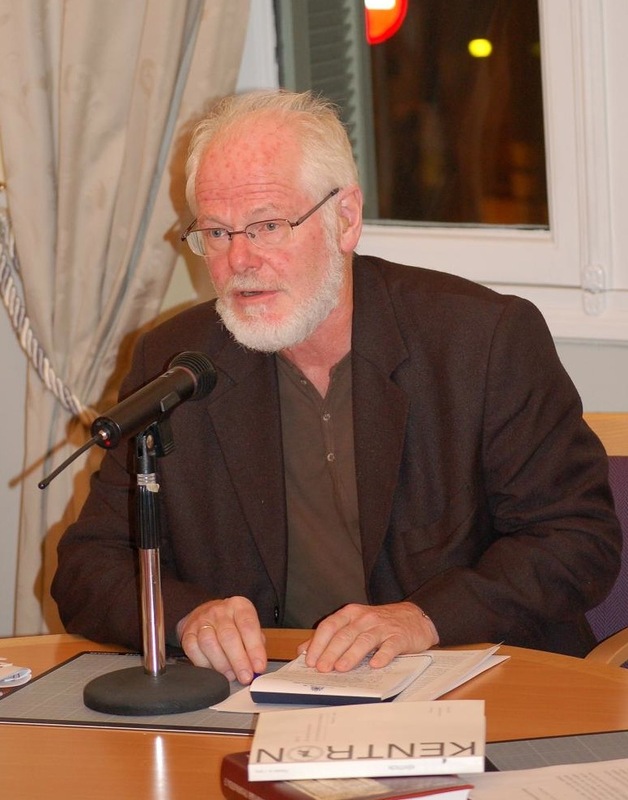 At the same congress, he also summarized our knowledge of the “Uses of Greek in the Nubian Kingdoms – Church and State” in a workshop on Languages in the Middle Nile Valley, and repeated the arguments that lead to the linking of the phenomenon of the use of Greek in Nubia, both in Late Antiquity and in the Middle Ages. A key point in this argumentation is the use of “Titles and Honoriﬁc Epithets in Nubian Greek Texts”, perhaps the most quoted Nubiological paper by Hägg (1990). In that work, he showed that the initial impulse for such a use came to Nubia from the Eastern Roman Empire in Late Antiquity and remained an inspiration for the local Christian court and Church throughout the Medieval period, thus lasting centuries after the conquest of North Africa by the Islamic caliphate and the seeming isolation of the Nubians from the rest of the Christian world. Moreover, proving that he kept up with the progress of Nubian Studies, Hägg suggested during the workshop as an excellent recent discussion on the role of Greek and Greek culture in Nubia a paper by Stanley Burstein published in 2008 (“When Greek was an African language: the role of Greek culture in Ancient and Medieval Nubia”, Journal of World History 19/1  41-61) – and rightfully so. This view of the Nubian cultures of Late Antiquity and of the Middle Ages as a continuum has been the inevitable outcome of the lifelong dedication of Tomas Hägg to the study of the use of the Greek language in both historical periods. It is characteristic that in words of honor spoken or written on Hägg’s cursus honorum, Nubian Studies occupied very little space – or none at all. Tomas Hägg was a professor of Classical Studies, and the scope of his work and research was as broad as the horizons that the object of his academic interest was covering in the periods of its highest peak. Towards the end of his life, Tomas Hägg became professor emeritus of the University of Bergen. I knew of his links with Bergen both from the scholarly visits of professor Christides there and from the publication in that city of one of the most important contributions to the historical knowledge on the Nubian world: the Fontes Historiae Nubiorum (1994-2000) covering the history of the Middle Nile Valley from the Pharaonic era to the Early Byzantine period. Tomas Hägg edited the Greek texts for the volume, while R. H. Pierce, T. Eide and L. Török contributed with the ancient languages of the Nile Valley and Coptic. What I did not know was that Henriette Hafsaas, the young scholar from Bergen whom I met in the Warsaw Conference of 2006, would become my wife and would be the reason for leaving my residence in Khartoum to settle in Bergen in June 2008. Naturally, this was the period that I had most contact with Tomas Hägg. He was visiting Bergen from Kristiansand frequently, supervising the progress of his students and working on the organization of his Nubiological library, still in Bergen from the days of the Fontes publication. It was a great honor to help him with the cataloguing of the oﬀ prints and copies of articles that he had collected during his intensive involvement with Nubian Studies. That ﬁeld he never turned his back on, but he expressed to me his pleasure that someone was linking again Bergen and Nubia academically. And he proved his support by traveling twice from Sørland to Hordaland in order to attend two Nubiological events organized at the University of Bergen: a presentation on one of the textual treasures identiﬁed during the studies for my Ph.D. thesis on the Greek manuscripts on parchments fragments discovered during ﬁeldwork in Northern Sudan by my hosting institution, namely the Humboldt University Nubian Expedition; and – in our last meeting, as it proved – a workshop dedicated to studies between the local and the regional around Sai Island in Northern Sudan (where Henriette and myself have an archaeological project running and for which Adam Łajtar also visited us from Warsaw, contributing with a presentation that was actually inspired by the ﬁrst publication by Tomas Hägg that introduced me to Nubian epigraphics, the one on the Euchologion Mega type of prayer for the dead. I will never forget how strange it felt to be arriving at Bergen on the 11th of June 2008. For that was the exact date that the University of Bergen honored Tomas Hägg with the title of professor emeritus. On that occasion, a seminary was organized, and in a playful manner the presentations were grouped under the title of psogos (reproach)! It would therefore be unwise to indulge myself into an attempt for an enkomion (praise) for the late professor. However, his aura shone so bright in all the ﬁelds that he cast his brilliant gaze upon, so that even from a distance students could beneﬁt from his priceless contributions. In my case, it was Tomas Hägg who taught me how to see the gaps in our knowledge about any given ﬁeld of studies as a challenge for more intense research, and as a determined ambition to oﬀer, but always in modesty and with academic accuracy, more to that ﬁeld. Perhaps there is no better way to conclude this text than the promise to keep up the eﬀorts to help make Bergen again a center for Nubian Studies and the source of important publications for the links between the Roman Empire and the Nubian kingdoms of Late Antiquity and the Byzantine era.